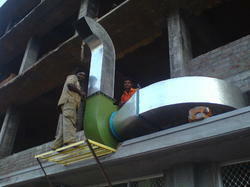 We are widely appreciated organization in manufacturing and supplying a wide spectrum of Exhaust Hoods. These hoods are manufactured by utilizing high-grade raw material, which is purchased from the most authentic vendor in the industry. These are widely used as optimum kitchen appliance and appreciated as well by the large number of our respected clients. We are one of the most authentic manufacturer and supplier of quality-assured Exhaust to our patrons. These high quality products are fabricated using optimum grade raw material, sourced from the most reliable vendor in the industry and are used in kitchens and canteens. Apart from this, patrons can avail these stain less steel product at the most market-leading price. We are engaged in manufacturing a quality range of Industrial Blowersthat finds application in diverse industries. These industrial blowers ensure high performance, smooth and vibration less operations. We make use of qualitative material which is heat and corrosion resistance with FRB coating. Further, to meet the requirements of our clients, we also customize our range.